Did you know that your body absorbs more chlorine through the skin and lungs while showering than while drinking tap water? This can irritate your lungs and have seriously harmful side effects over time. Chlorine also strips protein from your skin and hair, leaving it dry and itchy. Get relief with an Enviro Products Shower Filter! New Wave Enviro’s Premium and Designer shower filter systems come with an optional aroma therapy diffuser in each package at no additional charge. The diffuser ring will hold an aroma chosen by consumers and installs easily around the outside of the filter housing, the heat and steam from the shower water will warm the aroma for a genuine “Spa Experience” with every shower. 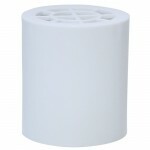 Our shower filters contain 16oz of bacteriostatic KDF-55 and 2oz of crystal quartz. Together, they remove chlorine and hydrogen sulfide, reduce heavy metals and naturally soften the water. Designed to fit almost all showers; simply screw on between the water pipe and your favorite shower head – No Plumbing Required! Shower filter w/box 1 lb 4.4 oz 3.5 in. 3.5 in. 8.6 in. Shower filter 1 lb 4 oz 5.5 in. 9.9 in. 3.2 in.